My mother loved Christmas ornaments. She would pick them up at yard sales, thrift stores and Hallmark store sales after Christmas, storing them in a little hallway closet. Whenever someone would visit, or she had to thank someone, she would do it with a Christmas ornament. My friend Margaret also started a nice tradition with ornaments. She gives one every year to a family member, writing the date on the bottom and selecting something that was memorable about that year. 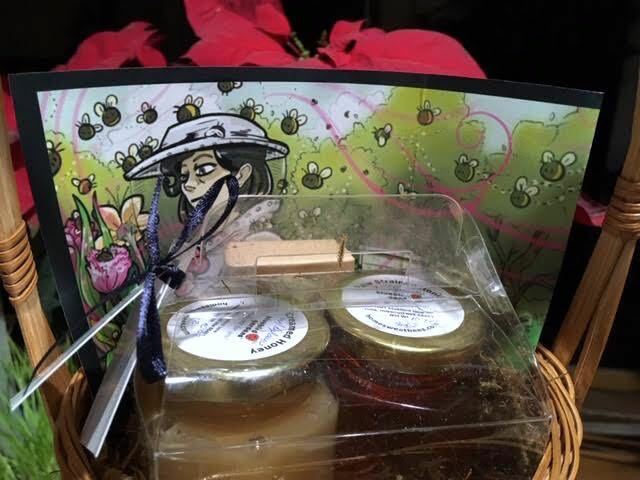 The generosity of these two ladies inspired me to add one of our handmade, hand blown glass honey ornaments to the top of this gift basket. The basket has two jars of honey, one as the bees made it, the second creamed honey. I added the graphic TEDXMissouriS&T is using to market their April 11, 2019 evening of ideas worth sharing since it gave the basket a nice back drop. And yes, I will be one of the speakers. It takes bees visiting about 40,000 flowers to collect the nectar and dehydrate it into one teaspoon of honey. To make 20 ounces of honey, the number of flowers they have to visit is in the billions. The basket is for a silent auction to benefit our local Extension Council. 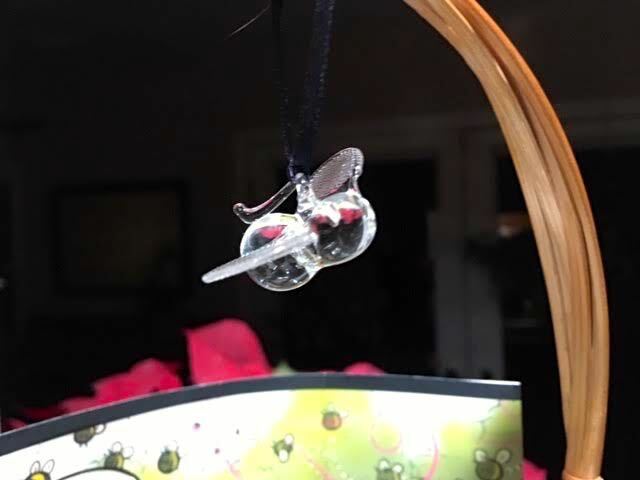 I have to confess, one of my cats took a swipe or two at the dangling ornament before it made it safely out of the house but short of that, the flying bee over the basket seems quite appropriate.